It was a sunny summer morning. I got up early, even though I still had over a month of summer holidays. This is one of the aspects of student's life I miss a lot: three months break in the summer. I started browsing the internet, looking for something on sourceforge. And there it was: this little banner of EVE Online. A friend, who attended classes with me, told me about the game earlier the same year. A colleague of his started the first polish fansite of EVE: eve-centrala.pl. My friend didn't say much about the game itself apart from the fact it's about spaceships, but this was enough to get me started. 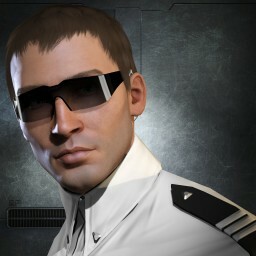 I have browsed the EVE website and a couple of fansites which I could find on google. I liked the setting and I liked the concept, but didn't want to start playing a game with subscription. So this morning, when I saw the EVE banner, I have decided to give it a try. I have signed up for the trial quickly and downloaded the 500 megabyte client package. I was to learn later that this was the 'Cold War' edition, which then had little meaning to me. Ten years ago, Lukas Rox was born. A decade is one hell of a lot of time. A lot has changed, both in my life, and in EVE. Wrecks were added. Wormholes appeared. Graphics engine was upgraded twice. It's hard to write it all up in one short post. That's right my friends, a giveaway is in order! Simply comment under this post using your in-game name (so I can reach you if you win) to get a chance of winning one of the amazing prizes. I'm overwhelmed and humbled by how great the EVE community is! Thank you everyone for warm wishes! I dug in my hangars a little more and found two more sets of Core Augmentation sets and added them to the giveaway! Comments must be posted between Aug 22, 2015 0:00 and Aug 29, 2015 0:00. Random draw will be held next weekend using Chribba dice. The ticket list which will be used for the draft is available here.